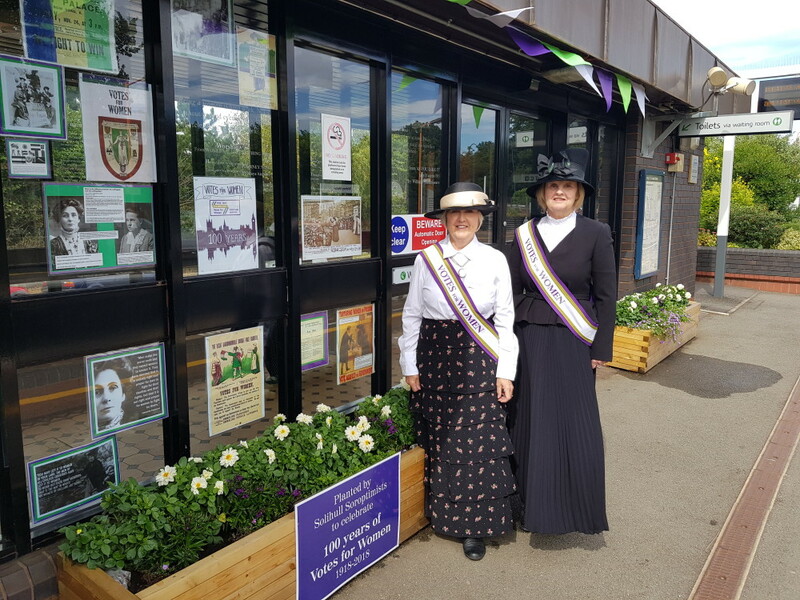 Station adopters at Widney Manor are celebrating the centenary of the Suffragette movement, with a themed display on the station platform. The group, who are all members of Soroptimist International Solihull & District Club, have created new planters with flowers and foliage in Suffragette colours, purple, white and green. 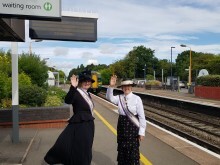 They are also displaying photos and memories in the station windows to help educate passengers about the journey to women’s rights over past 100 years. The display will remain at Widney Manor station until Thursday 20 September, when it will move to the ‘Fun in the Park’ event at Tudor Grange Park. ‘Fun in the park’ is a family event organised by the Soroptimists, which is taking place on Sunday 23 September. To link with their display at the station, the group will be running a poster competition for children during the day. Entrants will be asked to design a poster to help celebrate 100 years since women in this country were first allowed to vote. They will be given the title, ‘If you were elected to the School Council what would you change in your local area?’. A number of prizes will be up for grabs, including free tickets for journeys on West Midlands Railway. The event will also include a display of classic cars, a dog show and other activities throughout the park. Proceeds raised during the day will go to support three local charities – St. Basils Nightstop, Lilly Mae Foundation and Solihull MIND. The 13th annual ‘Fun in Park’ event is being organised by Solihull Soroptimist. The event is taking place Tudor Grange Park, Monkspath Road, Solihull, on Sunday 23 September from 1100 – 1700. Parking is available in the Monkspath Hall Road Car Park. With 54 members, SI Solihull and District is a vibrant club offering a lively and varied programme of meetings and events throughout the year. Our members come from a wide range of backgrounds and occupations including finance, education, pharmacy, secretarial, and IT, as well as members who have retired from their jobs. 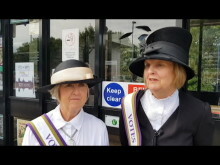 Soroptimist International Solihull & District Club is an organisation for women of today. 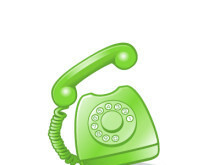 It is a member of Soroptimist International, the worlds largest women’s service organisation. It is committed to a world where women and children achieve their individual and collective potential, realise aspirations and have an equal voice in creating strong and peaceful communities world wide.